What In Startup is a simple Windows startup manager that allows you to see, disable, enable or delete programs loaded during windows startup. The idea is to improve the startup time of the computer by removing or tweaking the stratup items. If you have a bunch of programs loading at the windows startup they will have effect on boot load times, this program will help you in hunting the resource intensive programs so that you can disable them to load or remove unnecessary ones. When you first run the application it will show you the list of programs running at the startup, for each program it shows startup type (Registry/Startup Folder), command line string, product name, file version, company name, location in the registry or file system. 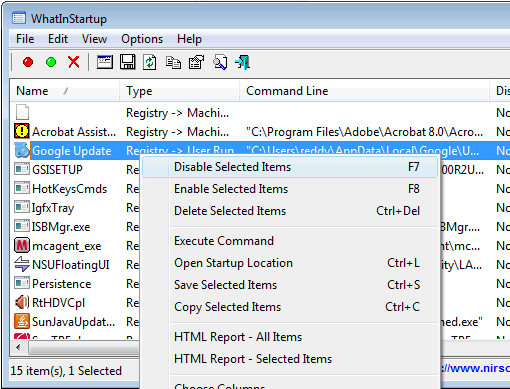 Right click on the program you want to modify its behavior and click the desired command. The app also gives reports as html items, you can select reports for all the items or for only selected items. What In Startup supports a permanent disabling feature, that will make sure any application you disabled will be disabled later it it adds itself to the list. WhatInStartup is a self executable app that works perfectly. It is a good app for optimizing your system startup. It with Windows 2000, XP, Vista and WIndows 7.